Here, I cover 5 online meditation timer websites that are available for free. Now you can do meditation by setting the preparation and meditation time. Also, you can set the chime (bells) in between the meditation. The chime produces a melodious sound that provides you relaxation and reduces your stress. You can set the particular time when you want to listen to the chime during the meditation session. Some of these sites let you adjust chime(bell) before the meditation starts/ends or in between. You can specify the time for each chime. One of the sites among all let you chant the Christian prayer that helps you to meditate. And one of the site that I’m going to mention below lets you choose the bell tone and background during the meditation. If you wish to use meditation software that reminds you to take deep breaths then you may read this article. Let’s go through each website. 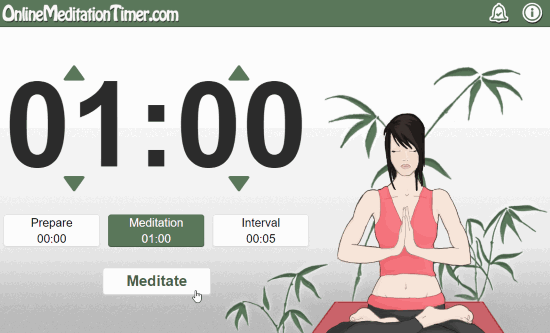 As the name suggests (OnlineMeditationTimer.com), this website works as an online meditation timer. When you visit the site, you will see three timers named Prepare, Meditation, and Interval. You can use the up and down arrow button to change the value of component and start meditating. Before you begin your meditation session, set the preparing time by clicking on Prepare. Then, set the time with the help of up and down arrows. The next step is to set time for meditation. You can set the time in minutes, seconds as per your preference. Setting time for Interval means you will hear a bell after every second/minute you have set in the timer. After that click on Meditate button. You can also use the bell icon at the top right in the image above to listen to the meditation bell without setting the time in the timer. This website (medivate.com) is another online meditation timer. Using this site, you can customize the bell. 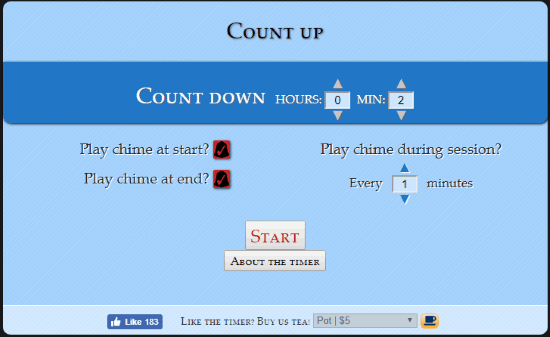 For example, you can play chime before the meditation starts or after the meditation ends with the timer. Also, you can play chime between the mediation by setting time like when you want it to play. To start the meditation timer, click on COUNT DOWN and then set the time in hours or minutes. Thereafter, click on start to start the meditation and chime will be played according to the preference you have set for it. You can record the meditation session but for that, you have to log in. 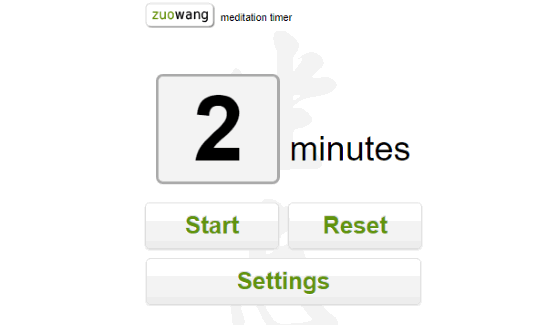 Zuowang Meditation Timer is an online meditation timer. You can set the timer in minutes by entering digits. After that, click on the start button. You can stop and resume in between. The site provides four custom tones and four backgrounds. You can select any of your favorite tone among all four tones. And also play alarm in between the meditation timer. 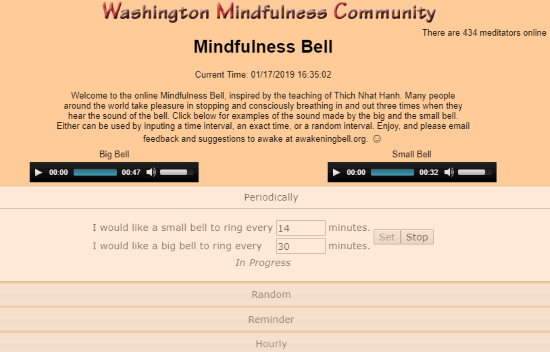 Mindfulness Bell is an online meditation timer. It works a bit differently. The site offers you two types of bells; one is small bell and other is big bell. Here, you cannot set the time of the meditation timer but set the time for bells in order to meditate. These bells will be working till the time you have set them to ring. You can set the time of these two bells periodically, randomly. Also, you can set/delete the reminder. The bell ring can be set in hours too. 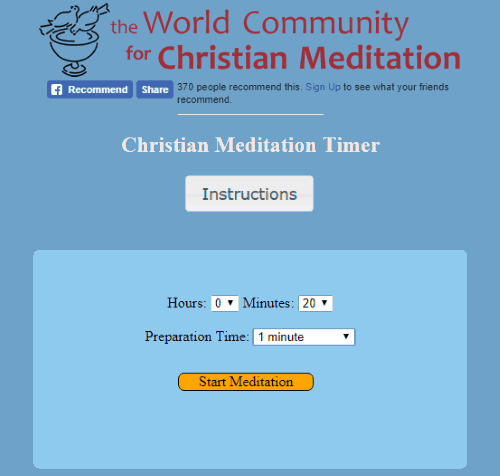 Christian Meditation Timer is a good meditation timer. The above image is easy to understand how the meditation timer looks like. You can set the time in hours/minutes. Also, you can set the preparation time. Then, click on Start Meditation. When the timer starts, you will see a motion sky where the timer keeps on running which you can stop in between. However, there is no option to pause/resume. If you want to read instruction then click on the Instruction button. It displays how to chant Ancient Christian prayer. I personally like Christian Meditation Timer as it provides you a motion sky where you can see and focus. Also, it lets you chant Christian prayer which helps in meditation. You can give these sites a try and start doing meditation.